James Buescher, driver of the No. 31 Chevrolet Silverado for Turner Motorsports in the Camping World Truck Series, is one of seven first-time winners in the series this season. Learn more about this winning driver in this week’s Fast Facts. James Buescher was born March 26, 1990 in Plano, Texas. He is the cousin of Chris Buescher, currently racing in the ARCA Racing Series. Buescher got his first taste of winning in the Bandolero class at Texas Motor Speedway, taking the national championship in the Young Guns division in 2004. He moved into the American Speed Association (ASA) Late Model Series, where he was named Most Popular Driver in 2006 after winning the Late Model Series South title. In 2007, Buescher split his time between the ARCA Racing Series and NASCAR’s Busch East Series (now the K&N Pro Series East); with his win at USA International Speedway in his series debut, he became the youngest winner in the history of the ARCA Series. 2008 marked Buescher’s big move to NASCAR’s Nationwide Series with Braun Racing, followed by spending 2009 in the Camping World Truck Series. In 2010, he spent part of the season with Phoenix Racing in the Nationwide Series, splitting with the team in May of that year and returning to the Truck Series with Turner Motorsports. 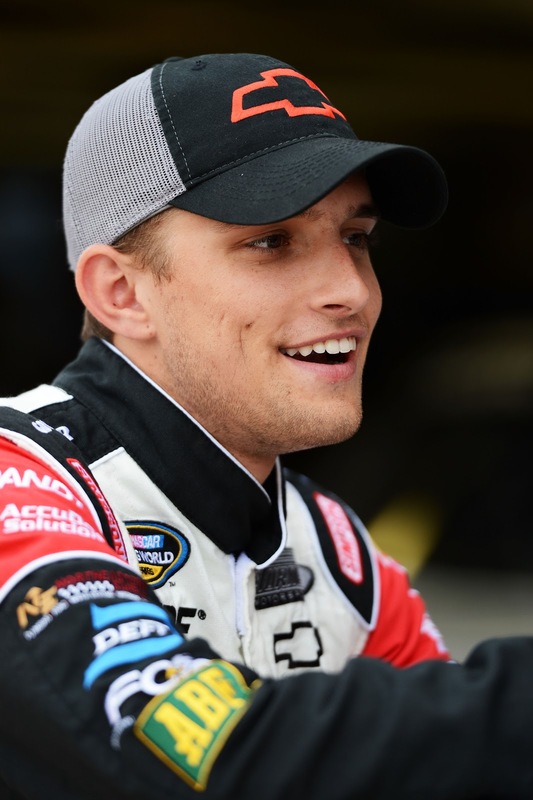 In addition to his full-time Truck Series ride with Turner Motorsports, Buescher also races part-time in the Nationwide Series for the team. Buescher has one win in the Nationwide Series, which came this year at the season-opener in Daytona. He didn’t get his first Truck Series wins until Kansas in April of this season. He has collected four victories on the season, including his win on Friday, September 21st at Kentucky. Buescher married the former Krishtian Turner between the 2011 and 2012 season in Costa Rica. Krishtian is the daughter of Turner Motorsports owner Steve Turner and was featured on the TLC show “Say Yes to the Dress” in preparation for their wedding. Check out the Skirts & Scuffs interview “Krishtian and James Buescher’s Love Story Has a Fairy Tale Ending” by Amanda Ebersole for more information on the duo. Find out more about Buescher at www.jamesbuescher.com.